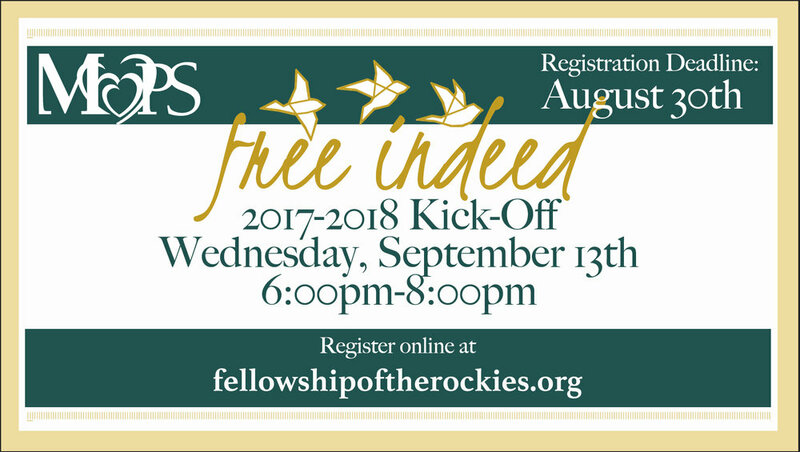 We are excited to start a new semester and we have many events and changes coming to Fellowship of the Rockies in the fall. We want you to be involved in significant christian relationships. Life groups are a way that anyone can get involved in a community of other believers and go deeper in God's word other than during weekend services. Life Groups are for everyone and there is one for you. Fellowship students Fall Kickoff is a fun event with Worship, Fellowship and a COLOR WAR to get you excited about the new semester. It's absolutely free and You are encouraged to bring your friends. The event starts with Worship at 6pm on Sunday, September 10th. KNECT is a Preteen Ministry. KNECT meets on Sunday nights at 6pm. The Kick off will be lots of fun so make sure to bring your friends. New 5th grade students are allowed to attend the fall kick off for KNECT. See what other events KNECT has coming up. All moms with kids of any age are invited to come check out MOPS. We will be kicking off the 2017-2018 year by enjoying a meal together, getting to know one another, encouraging each other and letting God refresh us through the struggles and joys of raising children. If you have been curious about MOPS, this is your chance to check it out! It's all free, but please register online by Wednesday, Aug 30. Finding I am by Lysa Terkeurst is a woman's bible study on Monday nights starting the Monday after kickoff weekend. over the six week course, explore the seven I AM statements of Jesus found in the Gospel of John. Childcare is provided. Promotion weekend is the weekend where children are promoted to the next grade up. Reminder students entering 5th Grade will be able to become involved in KNECT and new 7th graders will be able to join Fellowship Students. Wired is a fine arts program for kids k-4th grade. We will discover how and why we worship through dance, percussion, singing, drama and more. The semester starts with a kick off party on September 10th from 6-7:30. The semester ends with a Christmas presentation of all we learned on December 3rd. The Journey is the first step in getting involved at Fellowship. Learn of opportunities that you can get involved with at the church. The September edition of this two night class starts just after fall kickoff weekend.